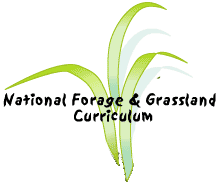 The National Forage Curriculum materials are designed to introduce learners to forages and the essential topics involved in developing and maintaining a successful forage-livestock operation. The course assumes learners can read, write, calculate and think at a minimum of high school (12th grade) level and are ready to work at the college level (13th-15th grade) in these areas. This test is intended as a tool for instructors to determine if their students have the basic information and skills to be successful in completing a junior level college Forage Production & Management course. Although the test has an agricultural flavor, the content measures some basic science knowledge, calculation, writing and graphing skills. This test was developed by instructional design professionals in concert with college level forage instructors. Performance data of students that take this prerequisite test coupled with class performance would be valuable to the NFC developers. If you would be willing to participate in an assessment project, please contact any of the individuals listed in the developers section. 1. Which of the following would best define forages? 2. Give an example of a forage. 3. A farmer sells hay to his neighbor every fall for $2.00 a bale. This year he decides to sell the hay for $2.45 a bale. What is the percentage of increase in the new asking price? 5. What is the basic difference between a ruminant animal and a monogastric animal? 6. Which of the following plants are grasses? Circle the grasses. 7. Graph and discuss the following information: In a forage class at a local university there are 25 students. Forty percent of the class plan to work in extension offices after graduation. One fifth of the students plan to enter vet schools. Seven students grew up on farms and plan to return after college and the remaining students are undecided about future plans. 8. Write a short paragraph supporting the following statement : Although every human should consume a good daily diet, the daily diet of a dairy cow needs to be more carefully monitored. 9. Write a one-sentence definition of "livestock". 10. Describe the importance of "rain in due season" to agriculture.